Women are generally under represented in video games. There are few female main characters out there and women tend to get pushed into supporting roles, love interest roles or people needing rescue. The rare times when the player gets to select their genre we often find their genre has no significant affect on the story, rendering the choice pointless. Rarely do we get to see women front-and-centre in positive roles, particularly in games where her gender affects the story. This week I wanted to find a game that would put a female character in the spotlight. I started with Violett. Violet is a 2.5-D puzzle solving game. Violet is a young girl who moves into a new house with her parents. Shortly after moving into the home, Violett is exploring and gets pulled into a sort of Wonderland where she is bug-sized. Violett gets captured by a bug and needs to escape and then solve puzzles to progress through the game. On each screen we are presented with a puzzle and need to complete it to proceed. Actions are performed with the mouse and with a limited inventory of items. Should we run into trouble there is a hint button in the lower-right corner of the screen that will give us clues as to what to do next. The artwork is fairly flat, but colourful, the controls are quite simple. Personally, while I appreciated the colourful, strange artwork and while the Wonderland concept appealed, I found Violett (the game, not the character) fell into the trap most point-n-click adventure/puzzle games have. That is, the solutions to puzzles are seemingly weird and require a very specific mindset to solve. In fact, sometimes figuring out what the puzzle was before attempting to solve it was difficult. Sometimes I wouldn’t know what the puzzle even was before I had died a few times and figured out I needed to disarm something to proceed. Sadly, even with clues to help, some puzzles completely baffled me as to their logic. In the end, I didn’t play Violett long, despite its interesting theme. The concept intrigued me. We are not a hero, we’re not going out to battle dragons or become queen. We are basically looking to survive, get along, make the world around us a better place. Unrest features two modes of difficulty, Myth and Mortal. The Myth level lets us have multiple save games while the Mortal option makes us live with our choices. Playing the demo I found we begin by being told our parents have news for us. We go visit our parents in their home and they explain we are to be married to a man of a higher caste (yay! ), but he’s a complete jerk (boo!). We are tasked with going to visit our husband to be and, along the way, we meet family members, other villagers and merchants who offer advice or ask for help. The game appears to offer several paths and we can choose to help or ignore people, choose to amass allies or stick it out on our own. In my run through I managed to figure out a way to make friends, get some money and steal a horse with the plan of escaping the village and thus avoiding marriage to a jerk. The game stays true to the setting. As a woman of a lower caste we can’t purchase weapons or talk to members of higher castes and men of equal or higher standing tend to be disdainful. There are friends to be had though, other women, other low caste members, people wanting help or trade. All in all, the demo left me interested and wanting more. I like that Unrest puts a different spin on the role playing genre. 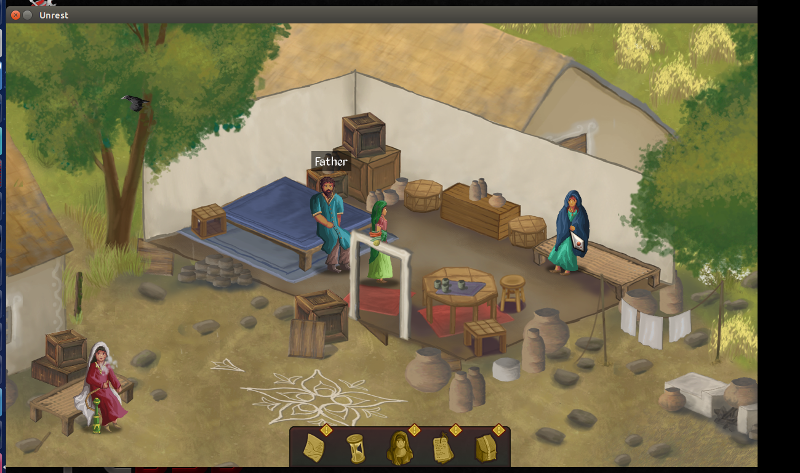 It is rare to find a game which takes place in India, it is rare to see a woman in the spotlight and it is rare to have a role playing game that isn’t a violent grind. I really liked the story-heavy aspect to Unrest and highly recommend it.